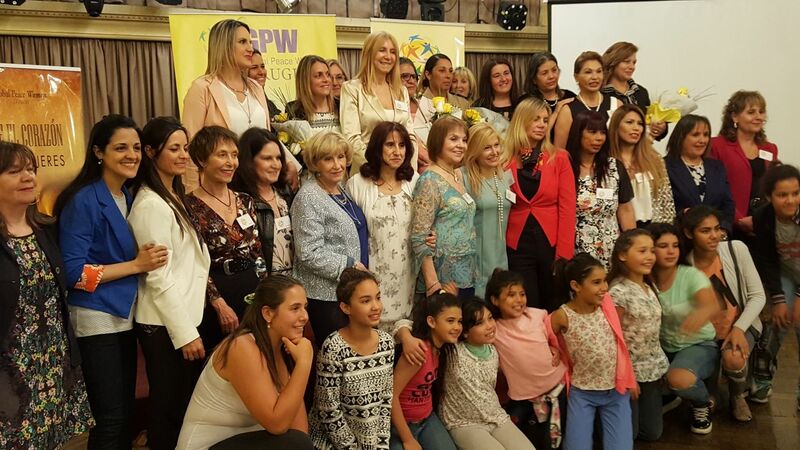 Global Peace Women Uruguay first highlighted the women that portrayed these qualities through the “Living for the Sake of Others Awards” in 2016. At their second “Living for the Sake of Others Awards” on November 23, 2017, three exemplary women and two institutions received the awards in the main hall of the Club Español de Montevideo. The awards were given to those who practiced “Living for the Sake of Others” through their acts of service involving women leadership. Mrs. Soledad Fontela: The Executive Coordinator of REDESUY who promoted the rights of people with disabilities and advocates universal accessibility. Mrs. Shirley Medina: A social activist who transformed the settlement of the Island of Gaspar and Larravide. Major Ana Lucas: In the year 2016, she was the first women officer of the Uruguayan Army who traveled to a Peace Mission and took charge of a group of 43 soldiers to a dangerous diamond extraction zone. Fundación Canguro (Kangaroo Foundation): An organization dedicated to provide nutrition to newborns and babies who cannot rely on general care. President Dr. Pamela Moreira and Vice President María Soledad Vieytes received the award. Paulina Luisi: Foster Home for Girls, a residence founded in the 40s with locations across the neighborhoods of Montevideo. Their founding purpose is the “protection, assistance, and formation of young women.” Now, 25 girls between the age of 5 and 17 can receive integral care full-time. The director of the house, Mrs. Cristina Conde, received the award.